Consultant Neurologist, South City Hospital, Karachi. 1Armed Forces Institute of Rehabilitation Medicine, Rawalpindi, Punjab, Pakistan. 2Combined Military Hospital, Okara, Punjab, Pakistan. 3Combined Military Hospital, Abbottabad, Khyber Pakhtunkhwa, Pakistan. 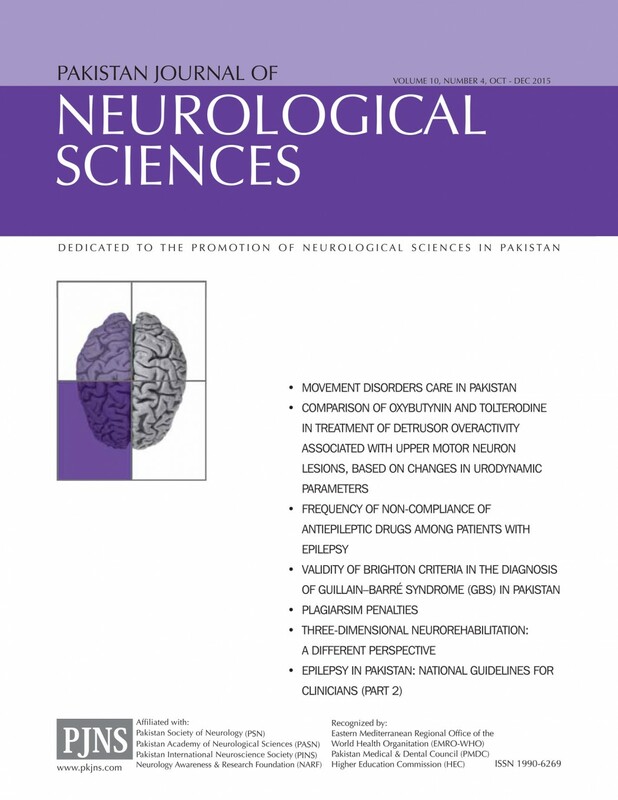 1Department of Neurology, Services Institute of Medical Sciences and Services Hospital, Lahore, 54600, Pakistan. 2Associate Professor, Department of Neurology, Services Institute of Medical Sciences and Services Hospital, Lahore, 54600, Pakistan. 1Department of Neurology, Pakistan Institute of Medical Sciences, 44000, Islamabad, Pakistan. Northwest General Hospital & Research Centre, Peshawar, Pakistan. 3PGR, Department of Neurology, Services Institute of Medical Sciences and Services Hospital, Lahore, 54600, Pakistan. Department of Neurology, Pakistan Institute of Medical Sciences, 44000, Islamabad, Pakistan.